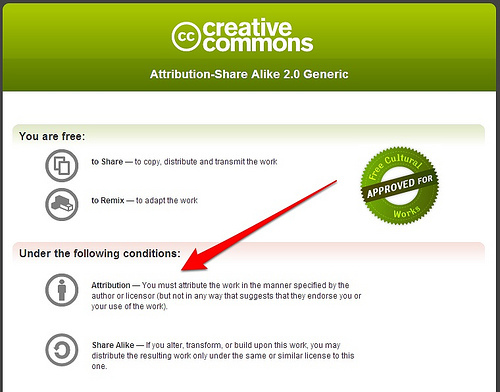 Creative Commons is supposed to be this great way for people to license out their works to others. But it’s annoyed me for ages how lame it is in practice, when it comes to Flickr. Notice the big red arrow pointing to the description. There’s nothing here that tells me how this work is licensed or how to attribute it. You attribute the work in the manner specified by the author or licensor (but not in any way that suggests that they endorse you or your use of the work). Assume since no attribution was specified, no attribution is required? I’ve seen the first four methods used, and I’m sure there are other variations people have come up with, since many CC licensed pictures under Share Alike fail to specify how they should be attributed (for instance, the first 10 “Share Alike” pictures I found in a car search at Flickr had no attribution info on their photo pages). Even when you do get attribution, things aren’t always clear. For example, TechCrunch took heat today for using some images without attribution. See how I’ve pointed to his attribution guidelines? Pretty straight-forward, right? Well, did Mark just want that exact text used, or did he also want to have a link to his site with that exact text? Are the rules different if used in an offline manner, where no link could be provided? 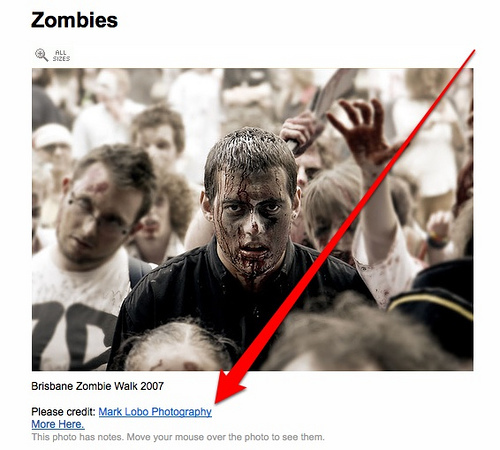 The TechCrunch link says only “Mark Lobo,” not “Mark Logo Photography,” and it points to the photo page on Flickr, rather than Mark’s photography site of http://www.marklobo.com.au/, which he specifiies. TechCrunch is also a commerical site, and the picture was originally licensed for non-commercial work. But it’s pretty clear from Mark’s tweet that he’s good with the usage now. Still, you can see how things can be confusing. Here’s another example where even with detailed information, things can still be confusing. 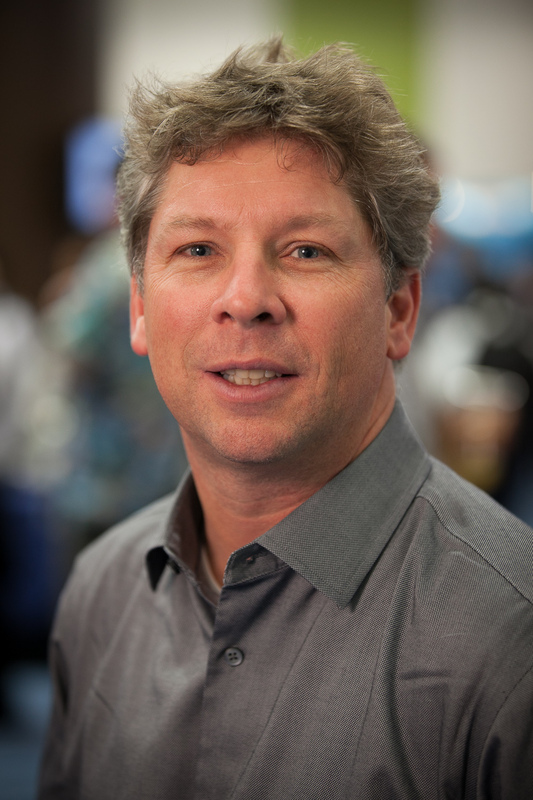 Michael Gray called TechCrunch out on another photo used without attribution in this story. I’ve presented it here under a Creative Commons license. You can use it but you need to present a photo credit and shouldn’t go photoshopping it into something else or use it to sell something. 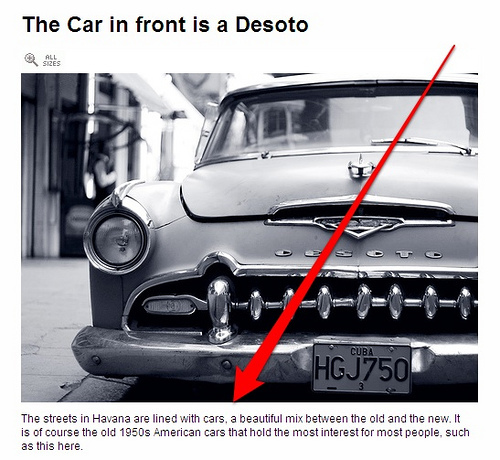 The attribution can simply be a text photo credit that is a hyperlink back here – that’s what Gawker Media sites do for the pictures they use from their flickr pools. TechCrunch (I guess eventually) went with naming him and a link back to the photo. But the “attribution can be” part of his guidelines implies that attribution could be something else. Flickr’s a major place where people seek Creative Common images. 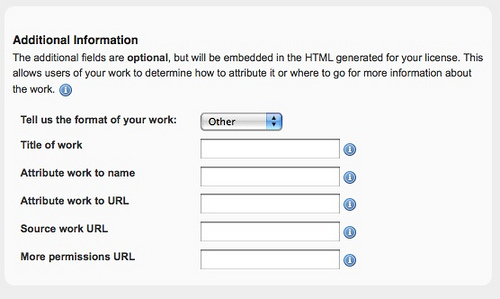 It shouldn’t be guesswork to figure out where attribution guidelines are (in the description? in the comments?). Both photographers and publishers wanting to use their works need Flickr to help expand what are proper, standard guidelines for attribution. That brings me to the big uproar over the Obama White House photos that went up on Flickr with a licensing description that caused some people to think they weren’t in the public domain. They always were in the public domain — it was just that Flickr didn’t have the right type of licensing option to show this when they were uploaded. But having the wrong license didn’t somehow pull them out of the public domain. It just gave some people the wrong impression they weren’t public. Except where otherwise noted, third-party content on this site is licensed under a Creative Commons Attribution 3.0 License. 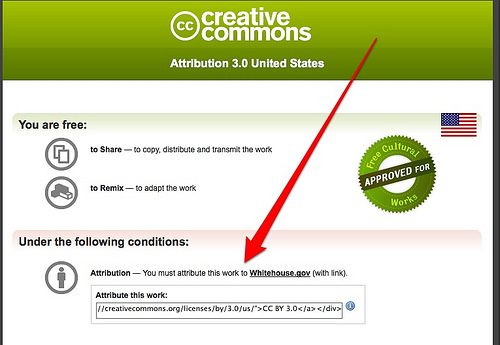 Visitors to this website agree to grant a non-exclusive, irrevocable, royalty-free license to the rest of the world for their submissions to Whitehouse.gov under the Creative Commons Attribution 3.0 License. Cool! The White House has some specific info on their license that I wish Flickr photos could have. How’d they do that? Flickr should tap into this. It should prompt you to add that type of information into a unique license for each photo, perhaps pre-populating the license with information you can fill out once (say your name, your web site and so on). Still, you can see there are further issues. It’s great that the White House says shared images can be reused with attribution by linking to the White House. But what if you’re using the image offline? Is text enough? I’m guessing so, but it probably should say.